Both Burlington High School and Catholic Central's varsity volleyball teams present their WIAA state championship trophies during a celebration assembly Monday night at Burlington High School. Burlington senior Maddie Berezowitz speaks to the crowd Monday, Nov. 5 at Burlington High School during the joint celebration of WIAA state championships by the Burlington and Catholic Central girls volleyball teams. When one thinks of Burlington, the name Tony Romo usually comes up pretty quickly in the conversation. So does high school girls volleyball. That was fortified all the more on Nov. 3, when Burlington and Catholic Central won their respective divisions at the WIAA State Girls Volleyball Championships at the Resch Center in Green Bay. Burlington defeated Oconomowoc 3-1 in the Division 1 match to win its second straight championship and fourth in eight years. Catholic Central, which was two years removed from a 5-23 record, restored its elite status with a 3-0 victory over defending champion Clayton for the Division 4 championship. 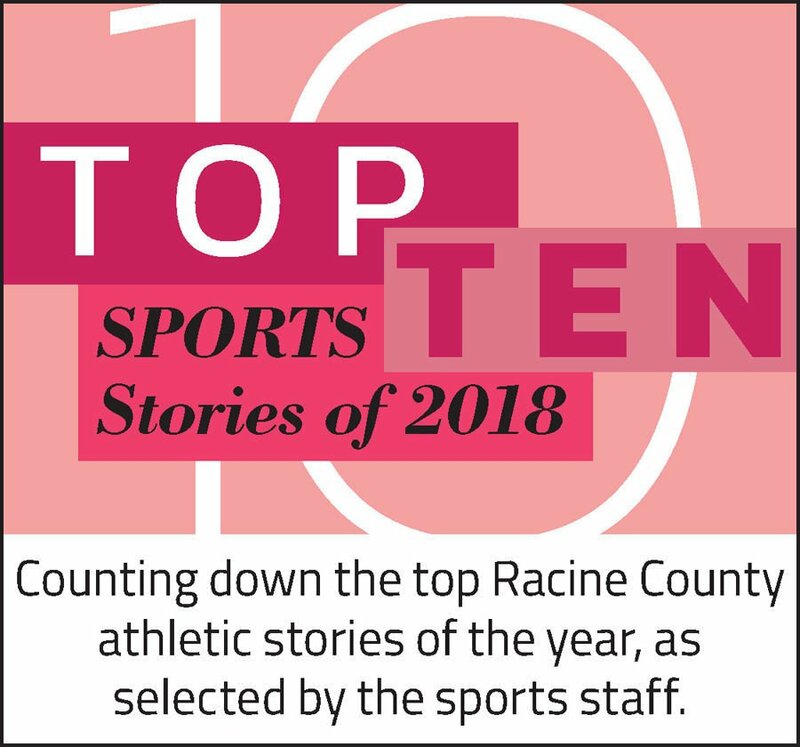 Of the top 10 local stories of the year as selected by The Journal Times sports staff, Burlington’s twin volleyball championships were ranked No. 3. The stories were chosen based on news value and impact on the community. Little and co-coach Dan Lynch have served as a foundation for that success. In addition to coaching all four of the Demons’ state championship teams, they have helped develop scores of players with their camps. Several of the players they worked with went on to play for Catholic Central. It all came together for both programs Nov. 3 with dominating performances. Burlington had lost to Oconomowoc during the regular season and opened the championship match with a 27-25 loss in the first set. And then the Demons barely hung on in the second set for a 30-28 victory. That’s when Little spoke up. And that’s what Burlington did. Behind eventual All-Racine County Player of the Year Maddie Berezowitz, the Demons closed out the match with victories of 25-19 and 25-17. Camryn Lukenbill finished it off with a kill off an assist from Kaley Blake. While Burlington was expected to contend for another state championship, Catholic Central was not. After winning state championships in 2006, ‘07, ‘08, ‘11 and ‘12, the program fell on some hard times that bottomed out with that 5-23 season. But first-year coach Wayne Schultz, the longtime Westosha Central boys coach who was lured out of retirement by Catholic Central athletic director Tom Aldrich prior to last season, connected with his young talent. And the Lady Toppers went on to defeat Clayton 25-17, 28-26, 25-22. Sammie Seib led the way with 20 kills and 11 digs. Elizabeth Klein was another standout with 46 assists and six assists.